The past years of California’s fire seasons has shown that wildfire season is now a year-long event. There are many reasons for the increase in wildfires and it is the cause of much debate. Arguments range from encroachment into forested areas, climate change and, of course, to fiscal management of public funds. Many of these discussions concentrate on possible precursors of events associated with wildfires. There is also a need to add teleological theory to this national conversation. Wildfires are eventually judged by the end results of the devastation. This includes second order effects such as the recent January 2018 fatalities caused by mudslides in areas recently burned by wildfires in Southern California. Modeling “how” administrators respond to wildland fires can be viewed and measured by many means. One could look at the fire prevention aspect, the increase of urban interface where people have moved deeper and deeper into the forest. One could also review the environmental aspect where logging and other means of “thinning the forest” has changed over the years. If administrators do not think about the forest and its needs, and continue to allow more and more people to build in the forest, there will continue to be an increased loss of life and property from wildfires. 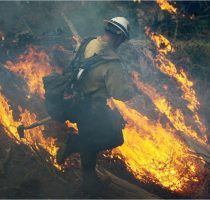 The climate change theory and forest management are also perspectives many seek to find solutions or at least an explanation of the fire phenomenon which is currently resulting in hundreds of thousands of acres of burned area each year. The damage from California’s recent wildfires forces administrators to ask two fundamental questions: First, is the traditional way of preparing and responding to these major conflagrations antiquated? Second, is there a new model that must be implemented to meet contemporary threats from wildfires? Teleological ethics is an aspect that should be considered when devising plans to reduce or respond to these devastating fires. Viewing wildfires from the end result can change perspectives on how administrators prepare for this unique hazard. 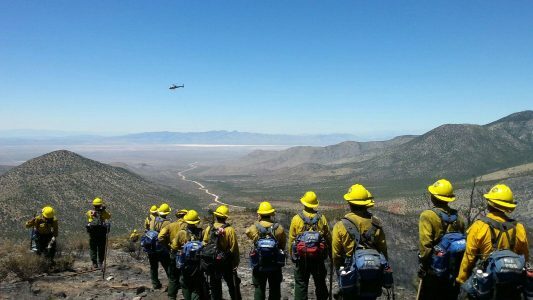 There are many facets and considerations when seeking results tied to the reduction of wildfires. A teleological approach to hazard mitigation stresses the correctness of an act is primarily determined by its result. Therefore, the means are justified by the desired end result. This approach has its own shortcomings, as administrators must consider other ethical aspects of answering the “ought” of what administrators need to do to mitigate future wildland fires. Reframing mitigation planning through a teleological lens can shed light on actions that may not draw attention until a hazard is viewed through hindsight. Moral actions frame the question of “ought” on providing reducing the severity of wildfires. What is right and what is wrong is the corner stone of ethics. What is good needs to be defined by administrators willing to view the issue of wildfires from multiple perspectives. Normative ethics in public administration would define a standard of conduct based upon societal views. However, the collective voice of society can change in the many contemporary issues faced by the nation. With the recent national discussions on a new tax bill, changing of healthcare laws and the Deferred Action for Childhood Arrivals (DACA), leaders must include in the national discussion the ethics of decisionmaking. Teleological ethics would argue that an action in itself being right or wrong, will be judged by the consequences of the actions taken. This is a powerful insight for administrators. Administrators need to look at the prevention of wildfires from the perspective of being fiscal stewards. Governments at the local, state and federal levels spend millions of dollars on suppression efforts. Considering the prevention aspect would result in less conflagrations and loss due to wildfire. After action studies have shown that often unethical conditions existed before wildfires; however, these conditions were not always easily identified. Decisionmaking is often led by the pressures to get the job done quickly, as well as other social factors that call for immediate measurable outcomes. Yet, many fail to recognize that unethical practices allowed forests to become overgrown in densely populated areas, setting up the elements for a wildfire. The Josephson Institute has for many years established a commitment for increased ethical competence and individual responsibility in administration and leadership. Public servants are faced with a large number of rules, governance, past practice and other inherently difficult standards to abide by when administering public programs. Each of these factors can cause ethical dilemmas for the administrator. As leaders, public administrators must acknowledge that if they permit people to build and expand in areas prone to high fire hazard, the nation will continue to see an increase of loss from wildfires. If administrators do not properly thin forests and spend funds on prevention, the current situation will not change. Continuing with antiquated past practices will not mitigate future wildfires. As leaders in charge of public safety, administrators must look outside the box and reframe their ethical perspectives in decision making. It is time to shift the focus of fire prevention. The current focus in on environmental concerns that lack practices to increase forest protection. Future public planning has to consider building with smart fire safety in mind. As an administrator, you must decide if you want to pay now or pay later. Author: Ygnacio “Nash” Flores, EdD, MBA, MPS, MA, is a faculty member in Public Safety Rio Hondo College. Email: [email protected]. The administrator seems to be placed in a very difficult situation. In my opinion, he must first realize that whatever decision is made will not be able to please everyone. Rather, they should focus more on what decision will be more beneficial to the community. it has become clear that these wildfires are inevitable and building into the forest comes with increase risk of higher damage cost and/or lives. The outcome of whatever is build deep into the forest should greatly exceed the risk in the form of benefits for the community. These new buildings should also be very cautious of the possible fire hazards and should be required to take extra precautions by exceeding fire standards and safety tips. I think this is a very informative and pertinent topic. Wild land fires are indeed becoming a more year around hazard and implementations do infect need to be made, as well as more awareness and change. Safety and awareness have always seemed to stick out to me personally, so being aware of what’s going on, how to change and make it better, and being able to move forward in a safe manner, and ensure that what is being done will ultimately result in the safety of all, is what the goal is at he end of the day.